West Boca Veterinary Center opened in the fall of 2008. We practice high-quality medicine in a modern veterinary hospital. Our hospital doctors and staff are devoted to the well-being of our patients as well as the education of our clients. You and your loved one's needs are our highest priority. We recognize that you have many options when it comes to who cares for you and your pets. Our affectionate and understanding staff combined with the knowledge and compassion of our doctors makes our hospital a place you will come to trust and consider part of your family. Our doctors advocate for the best in your pet's health. They will take time to go through your animal's physical exam with you to help you understand the health and needs of your pet. They will develop a treatment plan with you specific to your animal's needs so that you can continue to keep your pet healthy and happy. We believe in safe and judicious use of vaccinations. We develop a vaccine schedule based on the risk of your animal to transmissable infectious diseases - not on a traditional yearly schedule. We use Merial non-adjuvanted Rabies and Feline Leukemia vaccines in our feline vaccine protocol and Merial vaccines in our canine vaccine protocol. These high-quality vaccines allow us to help minimize the risks of vaccine reactions to our feline and canine patients. 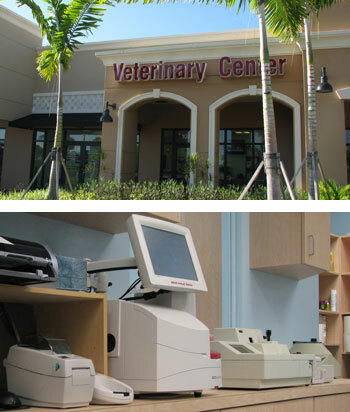 At West Boca Veterinary Center, great care and thought goes into our ability to provide your animals with the best medicine available. All of our in-house lab equipment, medications, surgical supplies and more are carefully selected with your pet's best interest at heart.